Get your family's favorite steakhouse sandwich on your menu with the 'Steakhouse' Grinder recipe. 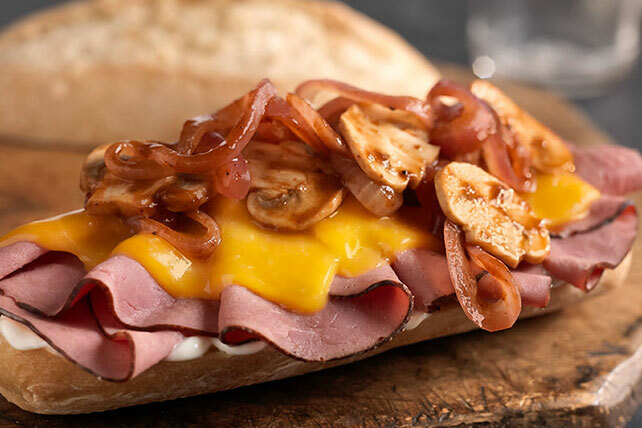 The 'Steakhouse' Grinder is piled high with sliced roast beef, mushroom, onions and cheddar cheese for a distinct flavor. Try our 'Steakhouse' Grinder recipe as soon as possible. Cook sauce and vegetables in skillet on medium heat 5 min., stirring occasionally. Meanwhile, stack meat on microwaveable plate; top with cheese. Microwave on HIGH 30 sec. or until cheese is melted. Spread roll with dressing; fill with meat and vegetable mixture. For extra flavor, mix 1/4 tsp. garlic powder with the MIRACLE WHIP before spreading onto roll. Broil, cut-sides up, until golden brown. Fill with remaining ingredients as directed. Prepare using a KRAFT DELI DELUXE Process American Cheese Slice.